When you bring your pet to us, it is important we do more than just make your pet look the part. Having a well-groomed coat means we get up close and as part of this process, we give your pet a visual health check to look for ticks, dry skin, lumps or grass seeds in paws, things you may not notice in day to day life. Above all else however, we want your pet to enjoy their time with us and leave knowing we have done more to maintain this happiness. Our grooming parlour comes with a garden that we let your pets run around in if they are with us for a longer time and we provide water for all our guests. Not only are they being bathed or professionally groomed to make them look the part, they are looked after by a caring team. I just want to say I highly recommend "Grooming Marvellous" in Exmouth, they do a superb job on Nando who is near impossible to groom as he is so excitable and fidgety. just been to collect him and he looks and smells great thank you guys! Thank you for the excellent work and results you achieved on Indi and Chinook. Both Max, our Border Terrier, and Stan, our Norfolk Terrier, are very well cared for when they have their coats smartened. Staff are courteous and welcoming. I recommend GM very highly. I love Grooming Marvellous! They always do a brilliant job with my Poodle/Jack Russell cross, Dave. I know he’s sometimes not the easiest of dogs but they are always cheerful and patient with him, as well as with me! Most importantly Dave always comes away with a gorgeous smart cut (and smells lush!). I have tried other groomers before but won’t be changing again now I’ve found this one. Very highly recommended by Alex and Dave the dog. Grooming Marvellous is the one stop shop for friendly chats and happy employees, come in and have your dog groomed whilst enjoying a cup of tea, service is always met with a smile, their positive attitude and skill with clippers will always bring you back for more. We have used Grooming Marvellous for two years now for our dog Oliver, we are more than happy to leave him in their capable hands and he always comes back looking absolutely superb. Fully recommend this brilliant service. Grooming Marvellous has been established since 1997. We are situated in a large spacious premises in Exmouth, Devon within a 30 minute drive of Exeter and 10 minute drive of Budleigh Salterton. 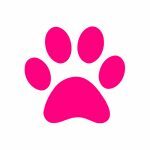 Our highly experienced staff offer professional grooming for all breeds of Cats and Dogs. 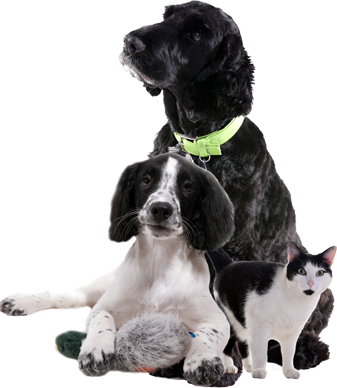 Your pets’ well being and comfort are our highest priority and you can rest assured our passion for animals means your pets will be looked after as if they were our own. How often should I get my dog/cat groomed? You should try to get your dog or cat groomed every 5-8 weeks to ensure a matt free coat and keep moulting at bay (that’s less hair over your home). With our grooming services, it will also mean a regular visual health check. You can opt for a full groom or a quicker, general tidy-up depending on your pets needs. 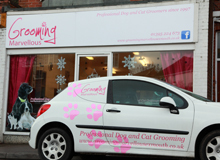 Situated in Littleham, just outside of Exmouth, we have a large, caring & clean grooming parlor for your cat or dog.